When visiting quilty events in foreign places, especially abroad, I hope, and expect, to see something different, – something we do not have at home, something new and exciting, – even exotic perhaps. But I also notice things that are familiar and similar to things I have seen before. Some times I know right away what the object reminds me of, and at other times it is just a feeling that I have seen it before, but cannot quite pinpoint what, where or when. When walking the Quilted Field in Suzdal I came across a couple of quilts made in a technique I thought looked familiar. When studying the photos after I got home, I recognized the sewing technique as “Skarvsöm”. I remembered reading about this technique many years ago in “Norsk Quilteblad”, the newsletter of the Norwegian Quilter’s Association. It was then described as a traditional patchwork technique in Sweden, well documented as far back as the 1700s, and mainly used for ceremonial cushions for weddings. “Skarvsöm” is made with woolen fabric which is felted so it will not unravel. It is often traditional patterns formed with squares, rectangles and triangles, but in between each and every patch or design element, a narrow strip, most often in a contrasting colour, is inserted, like a passepoil or piping. When the seam is finished, the strip is cut even with the surface on the right side of the work. Here and here are examples of how it is made, and in Sweden’s Digital Museum you can see many examples of old items made in this technique, so it is well documented. Here is a blog post with a short article on the history of this kind of quilting in Sweden. 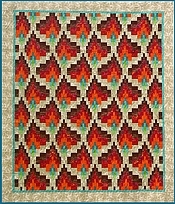 Åsa Wettre also dedicated a whole chapter to this technique in her book “Old Swedish Quilts”. Since I could see no names on the quilts above, I wondered at first if someone from Sweden had entered their work in the Quilted Field project, but dismissed this idea as I thought our Swedish travel companion, Anita Fors, would have mentioned it if this was the case. My curiosity aroused, I messaged the organizers and asked about the names of the quilt makers, and if this was a traditional quilting technique throughout Russia. Within a few hours I got to know that this is a traditional technique from Yakutia, and the two makers are Anna Zverova and Vera Vorfolomeeva. I noticed she had used not only one, but three strips of fabric in the seams between the patches, all throughout the red/yellow/black quilt, and in a few places on the other quilt too. 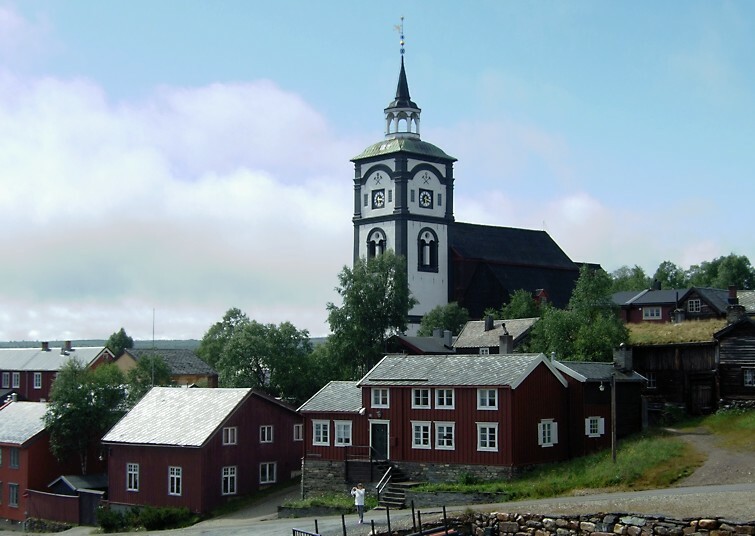 It has been interesting to observe and learn about all this, and as often happens, new information creates new questions and more curiosity, – in this case as to what could be the connection between the Swedish and Yakut traditions. Given that the two geographical areas are almost half a world apart, it is probably pure coincidence, – but I cannot help but wonder. After studying all this, and also having long online conversations about the subject with our travel companion Anita, I got a sudden urge to try my hand at “skarvsöm”. Just take a look at the beauty here. This kind of sewing is called “kybyty” in Russia. Here is a You-tube-video where Vera Vorfolomeeva shows how to do it. Here is also a stunning picture of the StBasil cathedral in Moscow that she has made in this technique. Sunday 14th August was the day the quilted field was to be laid out. The weather forecast said rain, so we were not sure if we were going to be able see it or not, but luckily it let up during the morning hours, – and so we were greeted by this gorgeousness once we entered the grounds of the Museum of Wooden Architecture. The quilts are 1 x 1 meters and have strings attached to all four corners so they can be tied together. This was a good thing as the gusts of wind occasionally blowing across the field, could easily have created some disarray. The Quilted Field is an ongoing project. Every year the 10 best quilts from the new entrants are chosen to be a permanent part of the project. At the moment they are aiming at having a large amount of very fine quilts to display at the event of Suzdal’s millennium anniversary, which will be in 2024. The best and most interesting quilts are exhibited for the rest of the week on the inside walls of the Eufemius Monastery. From what we saw, they will have no problem of filling up the fields with exquisite quilts in 2024. There was a lot of creativity, skill, beautiful colours and design displayed at our feet while walking the field. The entries come from all parts of Russia and also from other countries. All entries are accepted, – none is turned away. There were so many quilts, and hardly enough time to study each one in detail as there was so much going on the whole day. (See my previous post) . However, some of them made me stop a bit longer to study details I found interesting. The participants of the Quilted Field do not get their own quilts back. At the end of the show, all quilts that are not permanent parts of the project, are packed in paper bags, and the entrants can choose a random paper bag with an unseen quilt to take back home. All the quilts have name tags on the back, with the full address, so you have the chance of making friends with the maker of the quilt you get, and the one that get yours. You can also choose to donate your quilt to the project and not get that unknown quilt in a paper bag. Since the quilts lay backs down and were tied together, there was no way we could see the name tags, so I have no idea who made most of these quilts, and can therefore not give credit to the makers. However, if you see your quilt here, feel free to comment below. There was also a special exhibition of wedding quilts hung in different places around the field. This was a separate competition. There was also a quilted car. The organizers have lots more photos on their website. 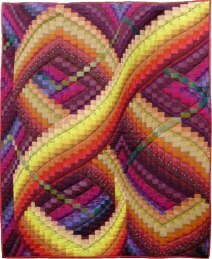 It is time for the Bloggers’ Quilt Festival again. Since I am working on commissions which can not be published yet, I will enter an older quilt into the festival this time. This wall hanging was made in 2004, and is one of a series of quilts I made using old photos taken on and around the island where I live. The photo I used here, was taken sometime in the 1920ies during the cod fishing season, which is usually in February till April. It is probably early in the season since there is still snow. The photo is taken on the fjord, which we have a good view of from our house. As you can see, there are lots of small boats on the fjord, each one hoping to get their share of the valuables still swimming deep down underneath, – hence the title I assigned to this piece: “Our Share of the Silver”. I manipulated the photo so that there are a lot more boats with women in them. Then I designed some blocks, which would look like a swirling school of fish when put together, and placed the photo in the middle. I also turned the photo blue to better blend in with the fabrics I planned to use. I thought it was a bit tame with only the blue colours, so I added some sunshine, – which I am also sure these women had in their lives from time to time. The photo was printed onto cotton fabric, and the rest of the quilt has both cotton and silk fabrics in it. The quilting lines follow the movement in the blocks surrounding the photo. The quilt was eventually bought by an organization who then donated it to the old people’s home in our neighbouring village Kalvåg, where it now hangs. This is entered in the Art quilt category of the Bloggers’ Quilt Festival. Be sure to go over there and have a look at all the beautiful works that have been posted, and also make sure you visit the other categories while you are at it. You can also vote for your favourite of each category from May 21st to May 29th. As I happen to look back into my computer’s photo albums, I find that there are more treasures I would like to share. In this post, the quilts are from the Russian Gallery at the Festival of Quilts in Birmingham earlier this year. This time the Russian gallery was a one person show by the artist Elena Folomyeva. She had hung an impressive body of work, with all of the quilts having a nature theme. Here is a closer look on the quilt that is behind her in the portrait photo. It is called “Tales of the Forest”. “At the Fountain” was the first one that caught my eye. I liked the mixture of patchwork, applique and “line drawings” in the quilt. I also especially loved the “Chameleon”, and the technique that was used to picture this elusive animal. “Portrait of a Woodpecker” and the Owl quilt (sorry, did not get the full title of the last one), both capture their motifs in a more “painterly” manner. Love the small details. The many layers in “Goose” appealed to me, – both the pictorial rendition and the flying geese borders. Also love the background details. The study of this Birch tree trunk is very well done. 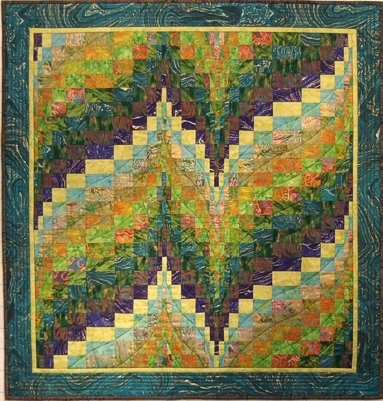 The diagonal shifts in quilting patterns and sewing technique add interest without disturbing the serenity of the motif, I think. I really loved the humour in this one: “Breakfast on the Grass”. I had to smile at the very appropriate holes. This one is called “He Who Woke up the Sun”. Solar energy really shows in the background quilting. 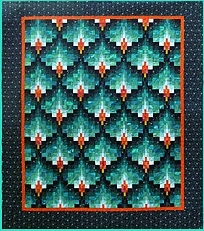 Here are more gorgeous quilts with plants in them, – each one very different from the other, yet somehow similar. This one is my favourite, I think. It is called “November”. The two quilts above were a bit different from the others in that they were in black and grey tones, but the theme is still nature. They are called “Cool Lace” and “The Night Garden”. Above is the artist’s statement that was hung with the quilts. Here are the links to the artist’s website, and her blog. Enjoy!